Category: Self Help & Personal Development Tags: babies, beds, exercises, insomnia, napping, nightmares, self-help, sleep, sleep expert, sleep problems, sleeping, sleeping positions, snoring, techniques. All too many of us are not getting the quality or amount of sleep we need. Perhaps we have difficulty drifting off, or we lie awake in the small hours, or have problems with a restless partner, or with bad dreams, or with our work-sleep patterns if we are shiftworkers or early risers. The big question is, what can we do about such problems? Who can we turn to, for a sympathetic and knowledgeable one-to-one consultation? The answer is, to one of the world’s leading sleep experts: Professor Chris Idzikowski, who here reveals his wisdom in a down-to-earth and reassuring way. 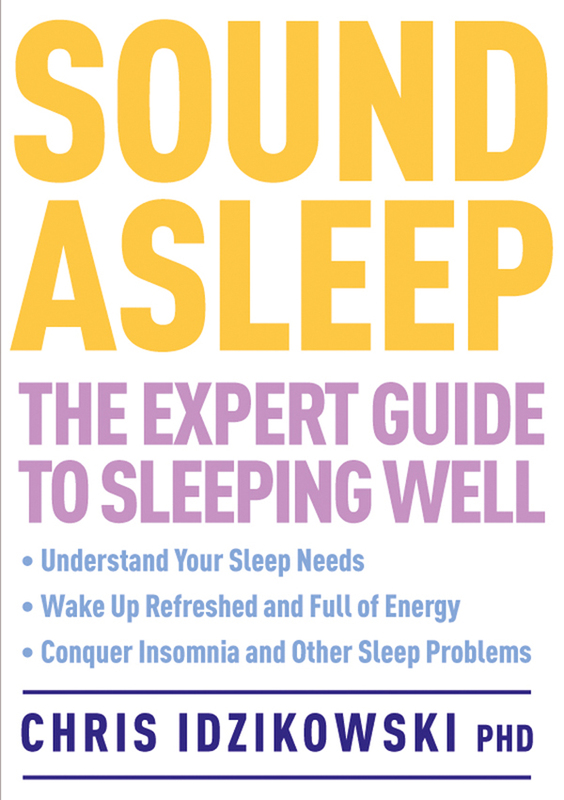 This book tackles all the common, and many of the not-so-common, sleep problems – from the different forms of insomnia to street noise, nightmares and loud hungry babies. Grounded in up-to-the-minute science as well as extensive professional experience in major sleep clinics, it offers effective ways to improve your sleep by easy lifestyle changes and simple, natural techniques. There is expert advice on sleeping positions, napping, snoring, beds, bedrooms, pre-sleep rituals, sleeping pills, and much more; as well as dozens of proven exercises, tips and techniques. Chapter One takes a fascinating look at the history of sleep, showing how social and environmental factors have affected human experience. Chapter Two tells us what science has made of sleep, in a friendly, easy-to-follow style. Chapter Three gives extensive advice on how to manage your sleep, whatever your particular circumstances or needs, with specific advice for workers, parents, drivers and flyers, as well as for dreamers and problem-solvers; also covered is our changing requirements as we age. Chapter Four gives the same number of pages to sleep problems, including insomnia, breathing disorders, circadian clock disorders, nightmares and movement disorders. Finally, Chapter Five is a collection of concise practical tips and guidelines, including a directory of sleeping pills and potions, from pharmaceutical stand-bys to home-brewed herbal teas. Dr Chris Idzikowski, BSc, PhD, FBPsS, is Director of the Sleep Assessment and Advisory Service and the Edinburgh Sleep Centre. A leading expert on sleep disorders, he has served as Chairman of the British Sleep Society and the Royal Society of Medicine Forum on sleep problems. Dr Idzikowski has also sat on the boards of the European Sleep Research Society and the US Sleep Medicine Foundation. He is the author of four books, including Learn to Sleep Well (Watkins).